At UC San Diego’s School of Global Policy and Strategy (GPS), learning is never limited to the classroom. Molding the global leaders of the future, four students had the unique opportunity to attend the 2017 United Nations Framework Convention on Climate Change (UNFCCC) that incorporated the twenty-third Conference of the Parties (COP23) in November. As leaders in climate action met in Bonn, Germany, our students attended as part of the Scripps Institute of Oceanography delegation, with a chance to present their views on this critical issue. As an environmental policy student, COP23 was a chance to witness the laborious process of global negotiation and political craft. As Americans, it was a chance to reaffirm our belief in shaping a better future by addressing the critical moment we find ourselves in and our commitment to challenging the sluggish pace we’ve adopted in addressing it. Stepping into the UNFCCC zone was overwhelming and exhilarating. The buzz of 20,000 people signaled the magnitude of the conference. In the days to come, we were able to hear from a handful of them in plenary time meetings, informational side events and while wandering the halls of the conference and interacting with national pavilions and the many booths set up by NGOs and other organizations. It was a bit surreal to be surrounded by a commitment hardly seen here in the states. California stands out as a progressive outlier in limiting emissions and moving toward carbon neutrality, and yet, as we had heard time and again in energy and environmental classes at GPS, the Paris agreements, as the first in a series of negotiations to come, only just addresses the issues of mitigation and adaptation. Much is left on the table if we hope to ratchet or efforts to limit warming to 1.5 degrees. At this momentous time, being part of an international community, if only for a week, addressing the future of our world was a lasting memory, and one which has made my degree at GPS all the more valuable. Overall, attending COP23 as part of the Scripps Institute of Oceanography delegation was a tremendous opportunity to hear directly from industry and policy leaders, as well as participate in official events and demonstrations of some of the innovative work done at Scripps and other places. 2017 was the year when the last global holdouts of the Paris Climate Accords indicated their acceptance of the climate goal framework, holdouts that included nations like Nicaragua and Syria. One large nation had a conspicuous absence, as President Trump has indicated his intention to withdraw the U.S. from the Paris Climate Accords goals. Indeed, while other large nations had huge official pavilions dedicated to the renewable projects and goals for greenhouse gas mitigation, there was not even an official desk from the U.S. Instead, about five feet outside the COP23 conference area was a huge “unofficial” U.S. pavilion, featuring speeches from environmentally conscious U.S. politicians and community leaders. As California Governor Jerry Brown pointed out in his speech to a packed room, due to a coalition of states and aligned clean industry groups, the U.S. is on track to meet its Paris Climate Accords’ mitigation goals, regardless of a lack of leadership from Washington, D.C. Despite the political grandstanding from Republican politicians and fossil-fuel aligned industries, market forces are moving towards renewable energy and a reduction of greenhouse gasses across the globe. Now is the time for NGO’s and research institutions, like UC San Diego, to step into the leadership void and provide more solutions and innovations in the coming years. 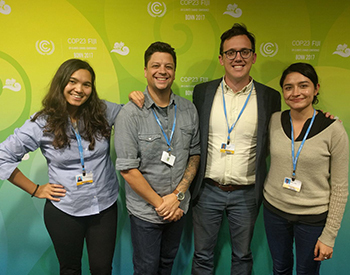 COP23 was a unique experience for environmental policy majors in several aspects. Being part of world politics, COP23 presents an opportunity to look inside a complex world, where there are many controversies. From what countries brought to COP23 it was clear where they stand on environmental talks and what they have to offer. As an international student, I was glad to hear not only American rhetoric but to also hear from those countries that are affected most by the climate change – least developed and developing countries. Although all nations share the same aspirations and common goal, their capabilities and technological developments could not be more diverse. While studying how policy decisions are made and their main obstacles, we got a chance to see how negotiations actually happen and how difficult it is to negotiate between so many countries who are so different in every single aspect. The biggest topics discussed were financial aspects of the Paris Climate Accord and NDCs (nationally determined contributions). I really learned a lot during the week by just going to workshops – from clean tech to urban planning and sustainable development. I was also interested to hear from different parties about their successful case studies, an active process for different cities and municipalities around the world. COP23 once again proved that multilateral negotiations is by no means an easy task, but seeing all nations working together towards one goal of mitigating and adapting to climate change is truly inspiring. As a graduate student with developed interests in environmental policy, attending COP23 with the Scripps delegation and fellow GPS students was a rewarding opportunity to interact beyond the academic space. I learned directly from experts, delegates and organizations who are working on a variety of climate change concerns, from greenhouse gas emission mitigation and adaptation to climate finance development. As a first-time observer, it was a unique experience to see the interaction between international firms, circular economy experts and government representatives offer their perspective on meeting Sustainable Development Goals (SDGs) and collaboration initiatives. Among these interactions it was challenging to witness that the U.S. government was not contributing to discussions, yet it was twice as encouraging to see U.S. private firms, state-level government agents, universities and NGOs collaborate in standing together and representing that the U.S. is still involved. It was great to see the U.S. Climate Action Center active on keeping the spirit alive on America’s Pledge to maintain presence and ambition in the absence of federal leadership. Overall, the conference was strong in encouraging discussion, highlighting success factors and encouraging action. Yet, one key takeaway for me as a GPS student was the need of policy intervention among scientific translation of these complex environmental impacts. It is important to think of how we can bring these issues “home,” from the international to national to individual level, and understand the urgencies of climate change and what can be done now. 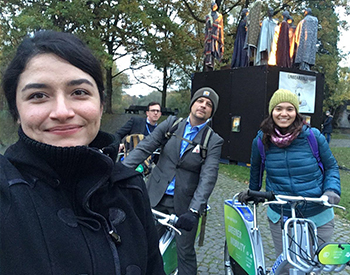 View a photo gallery of the COP23 experience, as captured by our GPS students. For further coverage, read UC San Diego News’s article here.